When Pink Floyd entered Abbey Road Studios during the first week of 1975 to begin work on their ninth album, the guys were exhausted. Their previous release, The Dark Side Of The Moon, had become one of the decade’s biggest hits, transforming the cult musicians into mainstream art rockers. Pink Floyd cemented their new audience by touring heavily for three years, but the time had come to do something new. Recording a follow-up to Dark Side wasn’t going to be easy, especially with that album still clinging to the upper reaches of the Billboard charts, its success hanging over the band like a cloud. Meanwhile, former Pink Floyd frontman Syd Barrett was suffering a mental breakdown. His crippling addiction to LSD had forced him out of the band in 1968, and a pair of solo albums had done little to resurrect his career in the intervening years. Peter Jenner, Pink Floyd’s original manager, even convinced Barrett to book some studio time at Abbey Road in August 1974, but the sessions petered out after three fruitless days. Barrett seemed to have lost his spark for good. Five months later, Barrett’s old bandmates could still feel his presence at Abbey Road. Or maybe it was his absence – the absence from Pink Floyd, from reality, from himself – that resonated throughout those halls, echoing off the stucco walls like the sinister guitar riff from “Lucifer Sam.” It had a profound effect on Roger Waters and David Gilmour, who wound up dedicating much of the resulting album, including the title track, to their AWOL friend. Wish You Were Here, like the record that precedes it, is a concept album. Revolving around the central theme of absence, Waters’ lyrics illustrate the difference between the group’s early years – when Pink Floyd was a band of brothers, making music for a small but devoted audience – and the present. The guys had become multi-millionaires in the wake of Dark Side’s success, but they’d also become cash cows for a corporate label, and the camaraderie that once existed between them had grown strained. Tying the song cycle together are two compositions about Syd Barrett: the nine-part opus “Shine On You Crazy Diamond,” and the short, haunting title track. “Wish You Were Here” opens up with a distant chord progression from Gilmour’s 12-string acoustic guitar, processed to sound as though it’s emanating from a car stereo. The sound crackles and pops, and when a second guitar swoops into the mix, the disparity between both parts is thrown into sharp relief. The second guitar is loud and blemish-free; the first is just a ghost, a pale shadow of what it must’ve sounded like when it was originally recorded. By 1975, Syd Barrett had become a pale shadow of his former self, too. When he made a surprise visit to Abbey Road on June 5, stumbling into the studio while engineer Brian Humphries tweaked the final mix of “Shine On You Crazy Diamond,” he’d put on so much weight that the others didn’t recognize him for several minutes. He’d shaved his head, too, along with his eyebrows. It pained Waters to see his friend so lost, so detached, so disengaged from the world around him. 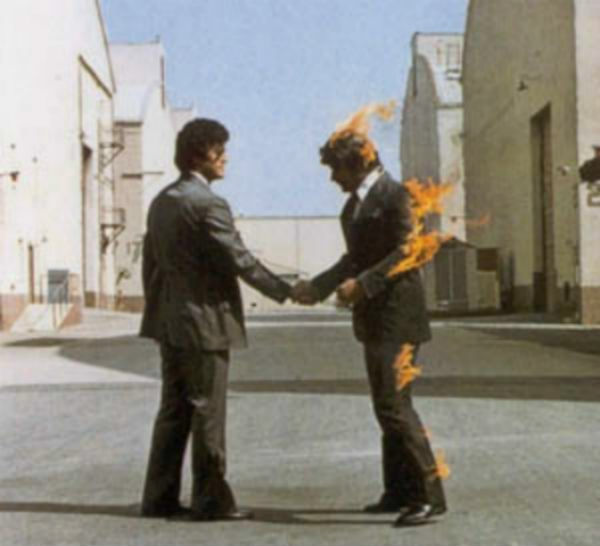 “Wish You Were Here” deals with that mental inability – the refusal, even – to engage with reality, and it served as much as a rallying for Waters as a sad tribute to Barrett’s better days. For David Gilmour, who sang “Wish You Were Here” in a wounded baritone, Waters’ lyrics struck close to home. Waters left the group ten years later, once a longstanding power struggle with Gilmour reached its boiling point. A nasty court case followed, with Waters seeking to permanently disband the group and Gilmour looking to retain the rights to Pink Floyd’s name. Gilmour won, but Pink Floyd never really felt like Pink Floyd again … at least not until July 2005, when Waters rejoined his old bandmates for a reunion performance at London’s Live 8 festival. And with that, the band segued into “Wish You Were Here,” the song they’d completed exactly 30 years prior.